Excellent. That bay window wraparound with the projecting piece of roof is really interesting looking. I'm curious: did the owner or the city rebuild the retaining wall? Good question. The retaining wall on my house (the 1910 Cole-Couch House at Norton and Club) is in a bad way, and I'd love to get someone else to pay for it. Alas, the preservation society paid for the retaining wall. The only thing the city granted was a temporary stay of execution. This is really inspiring - it's nice to see some success mixed in with all the loss. Wish there were more of it! Unless my eyes deceive me, it looks like the fire hydrant got a new paint job -- and a slightly new location -- too. Thanks for the praise of my job on the interior Gary. I love the house and the neighborhood. My hope is that 618 Arnette ave. is the first in a long list of similar stories of success in Durham. Andrew - I think it is just the way the picture looks; I think the hydrant is in the same spot. Nick - so glad you stopped by. I'm very impressed with your work, and I'm thrilled that you are a good steward of the house and the neighborhood. A good Friend of mine posted a video on youtube of the Durham Hotel implosion in 1975. I thought you would be interested in this footage. That's amazing. I had made a little 'video' out of some stills of the implosion of the Washington Duke in preparation for my foray back into downtown in a few weeks, but I didn't know there was real film/video footage out there. Thanks so much for posting it, and I plan to relink it in my Washington Duke post in a couple of weeks. Anyone notice how the crawl space disappeared around the house, along with some of the land? I wish that oldest picture of the house extended a little more to the left: it'd be nice to see how much dirt was there earlier. I guess it's a good thing that retaining wall was built: if more land had gone away, the house might not have survived. Joe - not sure exactly what you mean by the crawlspace disappearing. The oldest picture vs. the newer are a bit deceiving in that regard because the new foudation the house was placed on was higher than the old foundation (because the ground was higher in back of the house and the sills on the back of the house had rotted away and the old foundation collapsed.) So the new crawlspace was actually larger than the old. The ground did erode away on the Jackson St. side, and we re-graded the front by hand to prevent the ground sloughing over the retaining wall. The new retaining wall was built much higher to help stabilize the ground/foundation footings. (But we could only afford to do the corner, which is why the old wall is still in place to the right/north of the front steps. So the house was jacked up, and maybe moved slightly? That might explain it. I've looked at these pictures a few times trying to figure out what the differences were, but didn't think about the possibility of the entire house being moved slightly. Yes, exactly. I believe the house was moved a little bit away from the other house, because it was very, very close. But doing that threatened to move it out over the sidewalk. Those choices were made before we got the house, so I'm guessing about the logic. Sidney Duncan Bragg is my great grandfather. 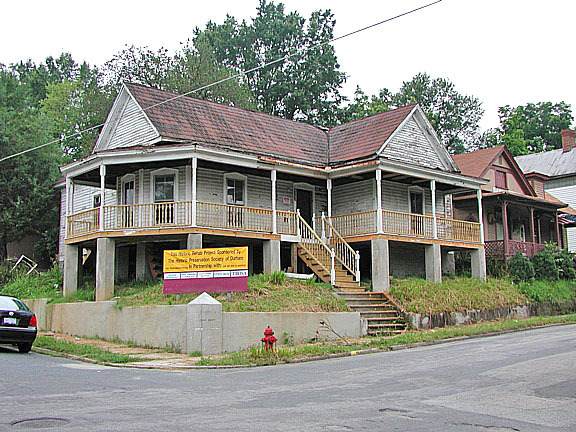 If the house dates to 1910 (according to one source), then he was probably not the original owner as the family moved to Durham from Granville County in 1912 or 1913. Sidney, a widower, and seven children (several of them young adults) were residents in 1919 according to Hill's City Directory, but the family had moved to a larger house on North Mangum Street by 1923. 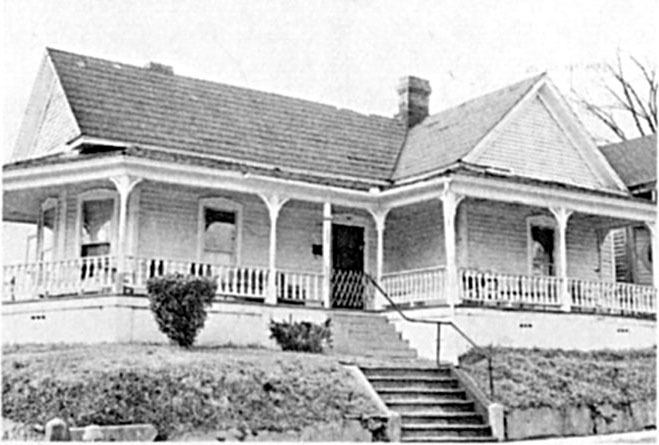 Another source mentions 'an open porch [that] provided the only access to two rooms'; if that oddity dates to 1919, perhaps it was added or renovated for Sidney's two sons, both returning WW I veterans. One meaningless, throwaway line I often hear when people are trying to justify why something needs be torn down is - "it's not worth saving." I heard it a fair amount about 618 Arnette Ave back in 2002. 618 Arnette Ave. was built in the early 20th century as one of several small Victorian houses ornamented with multiple sawnwork details and a wraparound front porch. It was originally the house of Sidney Bragg, a farmer. Picture taken in 1978, looking northwest from the intersection of Arnette and Jackson. The house was still in apparrently good shape when I lived across the street from it in the early 1990s. However, by the late 1990s, it had deteriorated significantly. The foundation had collapsed in spots, and the back of the house was laying on the ground. A new owner placed the house on a new foundation, but was unable to proceed with further repairs. The house in Spring 2001. 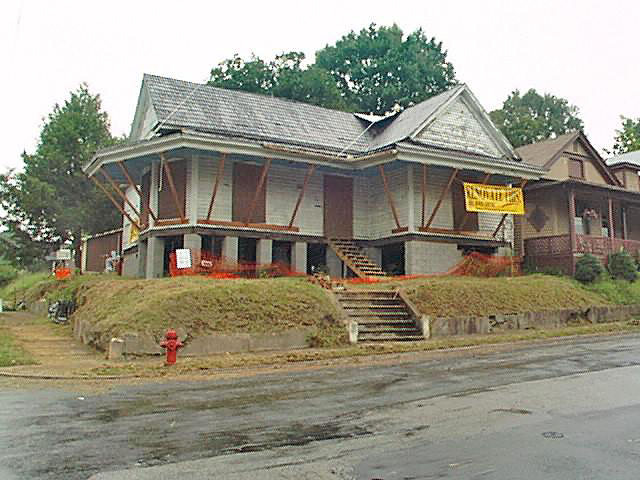 I was working with the Historic Preservation Society's Endangered Properties Program at the time, and we identified the house as one that we wanted to try to save. 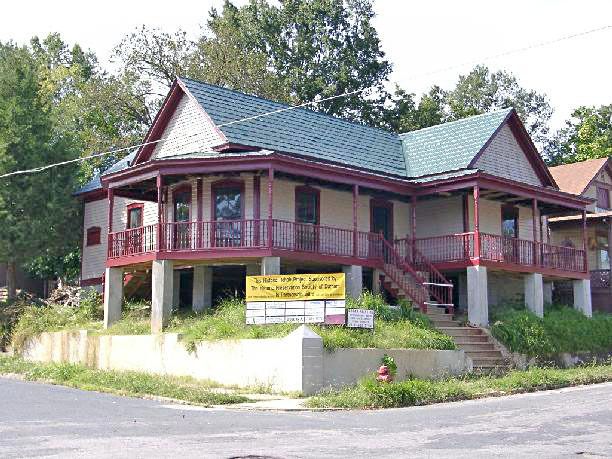 We acquired an option to buy the property, and attempted to find a new owner to do a complete restoration. 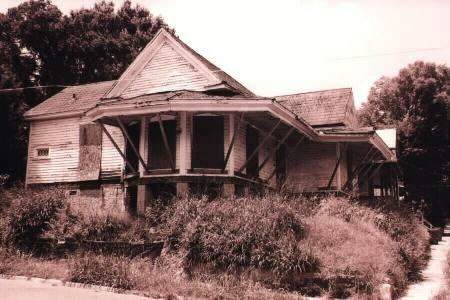 The house in 2002 after a cleanup day. Unfortunately, this was the good side of the house. The back was wide open and rotted away. We were unable to find someone to take it on. Meanwhile, Housing and Community Development was chomping at the bit to tear down the house. We met with them several times to ask them to delay demolition, which they did. Eventually, we decided to purchase the house ourselves and begin renovation. Marty Hanks was the contractor, who worked very hard on this house to resuscitate it, and did a very good job. A core handful of dedicated volunteers in the Endangered Properties Program gave a lot of time and effort to this project. Here was the house after many months of renovation. It had some structural integrity again, and although still fairly shell-like on the interior, was starting to take shape. In March 2004, we got the neighborhood out, and the Endangered Properties Committee got their hands dirty as well cleaning up the yard. The current owner purchased the house in - I believe - mid to late 2004. He completed the interior renovation, and did an amazing job with it. So, was it "not worth saving"? It was a lot of work, to be sure. But had this house been torn down, loss of history and architecture notwithstanding, it would have been a basically unbuildable lot, in a very prominent spot. Now it is occupied by a homeowner who is renovating two other houses in within 1-3 blocks and obviously cares deeply about the neighborhood. I'd call it a win.